Andrew: Hello readers! Because the wife was working late last night, I ventured to the local AMC to catch a showing of this past weekend's new horror film, The Purge, starring Ethan Hawke (Sinister) and Lena Headey (HBO's Game of Thrones). In general I wanted to see this movie because it's a horror movie and those are my jam, but I specifically wanted to see this one because of its fantastic premise. Now let me preface the rest of this review by saying that because I want to delve into what the film is and what it could have been, I'm going to be talking heavily about the plot, probably even summarizing the movie in a "running commentary" style. Therefore I'll give a big ol' ***SPOILER ALERT*** for what's the follow. So stop reading if you don't want the film spoiled for yourself. Ok, so the here's the premise: It's the year 2022 and America has undergone some sort of revolution, with a group referred to as the New Founding Fathers running the country. Unemployment is only 1% and crime is virtually non-existent with the exception of a yearly event called The Purge. The Purge is a 12-hour event from 7pm to 7am, once a year, where all crimes including murder are legal (with the exceptions of government officials Level 10 or higher being exempt from being killed, and weapons above a certain level being illegal to use, which I'd imagine include weapons of mass destruction, bombs, etc.) and all emergency services are suspended during this time. The point being that once a year everybody in the country is allowed to vent out their frustrations and anger and commit whatever crimes they like. That's a helluva premise for a movie that is just LOADED with possibilities, and I'll get to what I think some of those possibilities should have or could have been a little later. But first I'll tackle the direction that writer/director James DeMonaco chose, and that's for The Purge to just be a home invasion film. home security monitors as a group of "purgers" approaches their house. 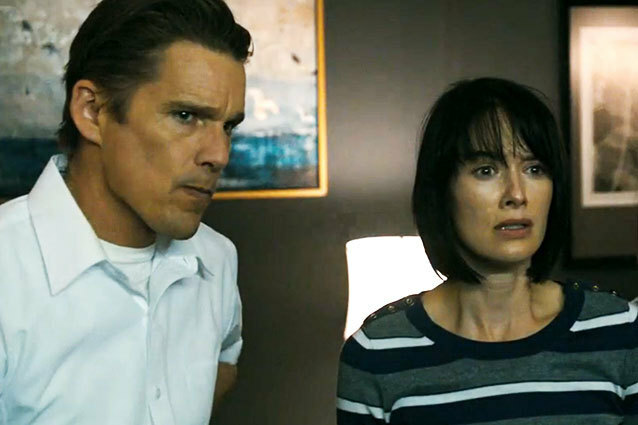 To go the home invasion route for this film is a fine choice, as it's one of any number of ways DeMonaco could have gone about this new America he's created, but the reason it worked for me was that Ethan Hawke's character, James Sandin, sells home security systems designed specifically to protect people during The Purge. He and his family have become rich off the threat of violence to their neighbors and others, which creates an interesting rift between the Sandins and their neighbors that's hinted at in an exchange between Lena Headey's Mary Sandin and a neighbor when they talk about a new expansion on the Sandin mansion. Mr. Sandin's profession also makes it that more interesting when his son, Charlie, subverts the whole security system when he sees a homeless man being chased by a group of Purgers and decides to let the homeless man in. This brings the Purgers right to the Sandin's door, demanding their prey be returned to them, otherwise they'll break in and kill everyone. Wait, what? They'll break in and kill everyone? That's right, it turns out that the home defense system that James sells isn't quite impregnable. Yes it has the nifty, heavy-looking metal doors that cover all the doors and windows to the house, but they're really just for show; a deterrence, more than actually making sure no one can break in. Okay, now we're getting somewhere interesting in my book. I liked the idea that the Sandins got rich off of selling safety to their fellow citizens and neighbors, yet the very same security system they sell can't keep themselves safe if some crazies REALLY want to break in. The Purge truly had me in its hooks all the way up to the point when the Purgers deliver their ultimatum. I dug the set-up of this future America, I dug that James was a bit of a smug salesman who profited off of The Purge, I dug the subtext about whether or not The Purge was really just a way for the government to rid the country of the weak and the poor who bring the rest of the country down (as told through news broadcasts on the TV), I dug that Charlie and his older sister Zoey weren't quite fans of The Purge because of the death and fear it brings every year, I dug the shot of a next-door neighbor sharpening his machete in the front yard like it ain't no thang, and I specifically dug the leader of the Purgers - only referred to as the Polite Stranger, played by an Australian actor I've never heard of named Rhys Wakefield, whom I'll touch on again later. So pretty much the first half of the movie I really dug, but sadly, I sort of lost interest once it became a home invasion flick. First it becomes a bit of a cat and mouse movie as the Sandins try to find the homeless man Charlie let in, who slipped out of their view when Zoey's boyfriend tried to shoot James. (Did I mention that Zoey's boyfriend sneaks into their house before lockdown and tries to kill James? No? That's probably because it has almost no bearing on the rest of the film save for giving the homeless man his chance to hide in the house; one of the many missed opportunities in The Purge.) This part of the movie is basically James and Mary creeping around the house with flashlights and guns (the Purgers cut their power) as they look for the guy, with a few boo-scares thrown in that didn't really work. Once the Sandins find the guy, the movie takes a moral turn where the Sandins realize they can't just turn this man over to the Purgers, otherwise they'll be just as bad as they are. It's at this point that the film turns into a Straw Dogs/Last House on the Left sort of siege movie, with Mr. and Mrs. Sandin taking up a variety of guns and hunting down the Purgers once they've broken in. At no point is any of this scary; instead it's just incredibly violent with gun fire, hand-to-hand combat and stabbings. Yet it's also at this point where the movie finally takes an interesting turn. The first of which is that after a particularly brutal fight where James kills two of the Purgers in a game room, James is unexpectedly stabbed in the gut by a machete-wielding Polite Stranger (and by unexpected I mean it was unexpected to me, as I'm sure it was unexpected to Hawke's character, too). I honestly did not see DeMonaco killing off the main character, but I applaud his decision. James is not a particularly likable character throughout the movie, and though he gets a shot at redemption, I like that he's ultimately done in by his decisions. The other twist is that the Sandins neighbors show up at the house and start helping the Sandins in their fight by shooting the remaining Purgers. I was caught off guard by the neighbors' decision to help the Sandins, since it was the neighbors that told the Purgers who had given the homeless guy shelter. So count another point in DeMonaco's favor for throwing me off a second time. 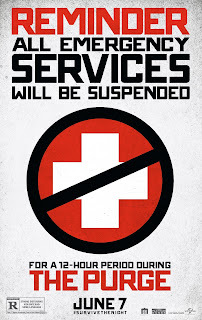 So now that I've gotten all of that out of the way, here's my big complaint about The Purge: it gives us a great premise, it sets up a world where for 12 hours every year everybody in the country is allowed to give in to their more basic human urges, but it confines us to one location and makes it a siege movie, when there is a whole WORLD of possibilities outside of this one mansion. I'll give the film credit for making nods to the subtext and satire I spoke of earlier, and for having an effective opening credits sequence that shows security footage of past Purges and the violence that people wreak on one another throughout the country. But you know what kind of movie I would have liked to have seen? A film where the main characters have to go out into that world. Something where, say, Charlie got stuck at a friend's house when The Purge starts and that house gets broken into, so James has to venture out into the madness to try and find his son. Show me some of this greater environment that's been created! Don't get me wrong, as I mentioned earlier I still dug the set-up, and I particularly liked Wakefield as the leader of the Purgers. I'm sure I'm not the first person to mention this, but he really did evoke a young Heath Ledger, right down to the smile, blue eyes and blonde hair. Wakefield perfectly played the kind of rich, well-to-do citizen who looks down on the homeless and the poor as scourge of the nation in this new America. He was legitimately scary with his broad grin and smooth-talking, but I don't think DeMonaco gave him enough to do. of killers that come knocking on the Sandins' door searching for their prey. The boyfriend subplot was another missed opportunity because it happens in a flash. It's set up just fine, with Zoey and her boyfriend Henry acting all lovey-dovey until her dad gets home, then it becomes apparent that Mr. Sandin isn't a fan of Zoey dating an older boy. Fine, that's a typical thing in movies/TV shows. But having Henry pull a gun on James and shoot at him was a development I saw coming from a mile away. Why else would he break back into the house before lockdown? To "talk" to Zoey's dad and convince him to let them be together? Of course not, not with this set-up. The problem is that this subplot reaches critical mass far too soon as a means to let the homeless guy sneak away. Henry winds up getting shot by James in self-defense and the subplot gets dropped just like that. I felt like DeMonaco could have kept Henry in the picture far longer - let him help the family try to find the homeless guy, let him help them defend the house from the Purgers, and only then when it seems like everything might be in the clear should his true colors come out. Would that be cliche? Probably, but at least it might make the impact a little bigger. I also felt like the movie suffered from too many characters doing things for the sake of the plot, particularly Charlie letting the homeless man into the house, and Charlie subsequently showing the man where his secret hiding spot in the closet is so his parents can't find him. (Here's an idea: why not have the whole family hide in the secret hiding spot? And if James sells security systems, why doesn't his company also sell panic rooms?) And later, when Charlie is directed to hide in the basement once the Purgers have broken in, WHY DOES HE HAVE A FLASHLIGHT ON? That makes finding him pretty easy. So there are a number of little things like that that bugged me as the film progressed, but none so much as the missed opportunities with the plot. Hawke and Headey do just fine in their roles, especially considering I didn't care for James and I was caring about Mary (maybe that has something to do with me loving Headey as Cersei Lannister, but I digress). Wakefield was a revelation, but too little used. Everyone else in the film is either just there to drive the plot along or to be killed in some violent way, which is fine I suppose. But altogether it just makes The Purge a disappointment because of what could have been. 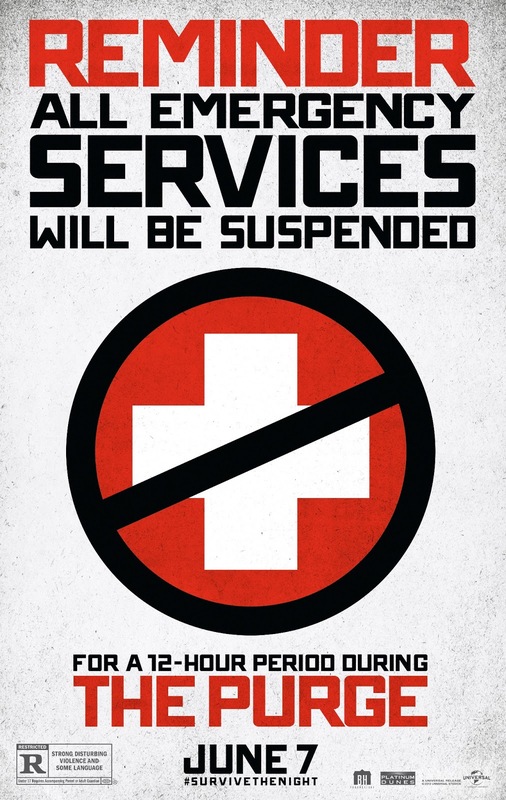 Here's hoping that The Purge 2 takes us out of the single location and into this new America.